Unifor Local 444 went on strike Sunday at Integram Seating, a Magna International company in Windsor, Ont. 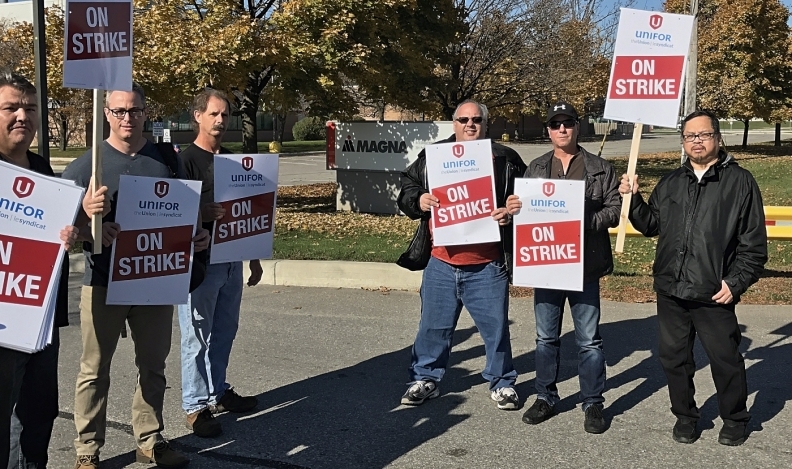 A brief strike by Unifor members at Integram (Magna) Seating is over after the two sides reached a new tentative agreement at about 4 a.m. Monday -- a day after rejecting a prior four-year deal -- Local 444 said in a Facebook post. Members will vote on the deal at 5 p.m. Monday at the Fogolar Furlan Club in Windsor. The two parties had reached a tentative deal early Friday, after bargaining was extended past a midnight strike deadline. But membership voted it down Sunday just before noon by a 58 per cent vote. Integram produces 1,500 seats and 10,000 foam seat parts in Windsor every day. Both FCA and GM rely heavily on the auto supplier, so a work stoppage has the potential to halt production at FCA’s Windsor, Ontario, assembly plant and GM’s CAMI assembly plant in Ingersoll, Ontario. Both rely on just-in-time delivery of the seats and parts. Unifor Local 444 President Dino Chiodo told Automotive News Canada that immediately after the deal was struck, the union allowed three trucks filled with foam seating parts for the Chevy Equinox to cross the picket line and get to GM’s CAMI plant, where the vehicle is assembled. Not long after that, some employees went to work to start production again at Integram.